One team has lost their shot at redemption, but there’s still 11 left. And on a bright, crisp morning in Kuala Lumpur, those 11 teams will learn that they will be flying to the capital city of Amman, Jordan! Teams will need to book their own plane tickets. But really, they will be on one of two flights from Kuala Lumpur. The first on Eithad Airways via Abu Dhabi arrives in Amman at 2:35am. The second, direct flight on Royal Jordanian arrives at 5:15am. 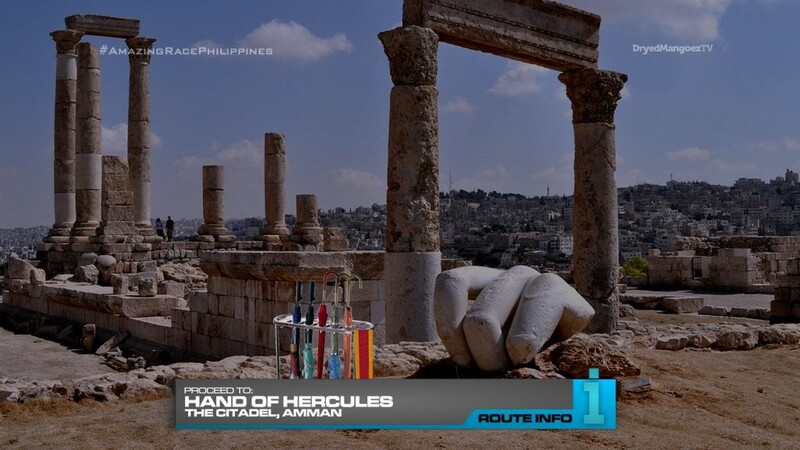 Once in Amman, teams must find the city’s “strong hand.” They’ll have to figure out that their next clue is waiting at the Hand of Hercules. 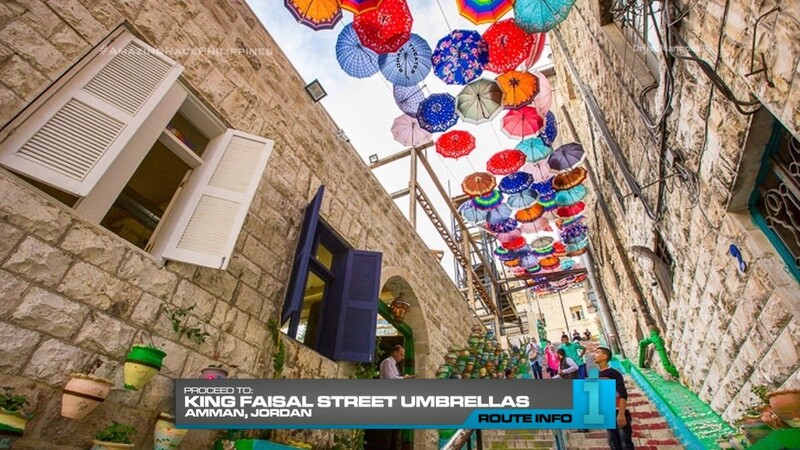 Along with their next clue, teams will also need to choose an umbrella which they must keep until further notice. 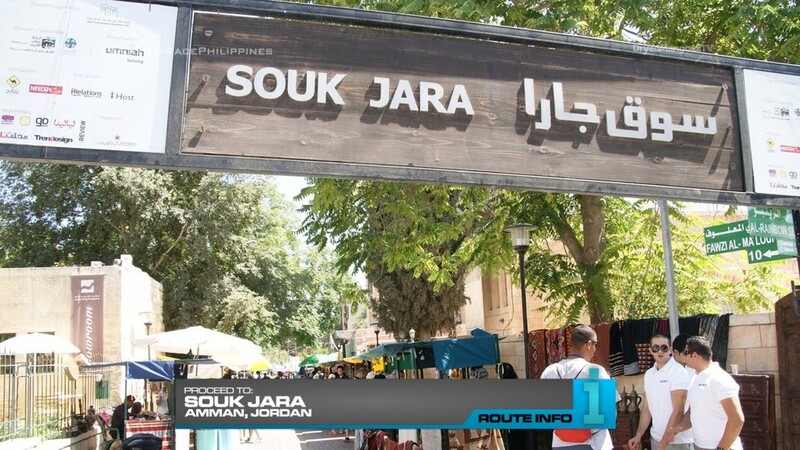 Teams must now make their way to Souk Jara and search the sprawling market for a specific store for their next clue. However, HOURS OF OPERATION! The store opens at 7am. 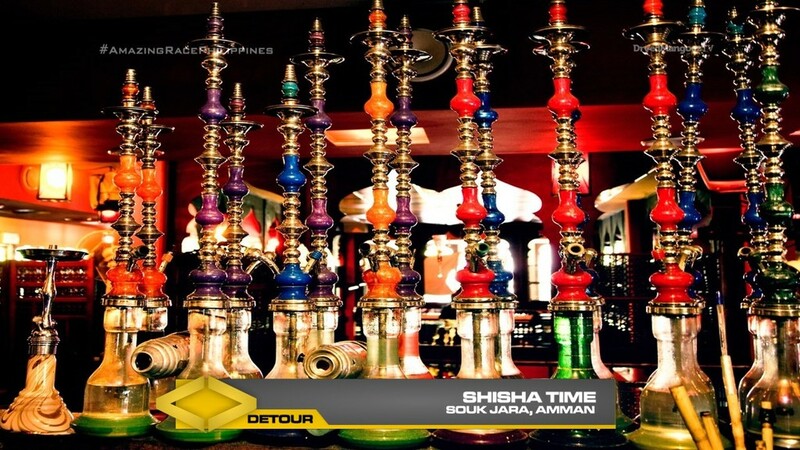 Once all teams have been equalized, they’ll get the next clue revealing the Detour: Tea Time or Shisha Time. In Tea Time, teams must learn how to make mint tea. 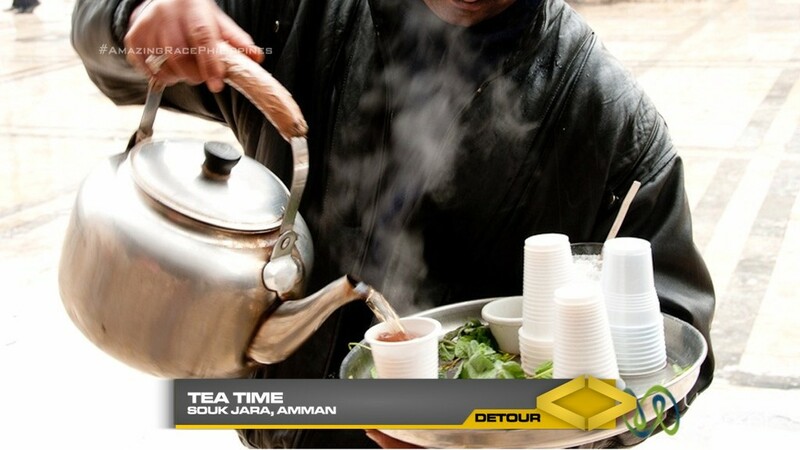 When they’ve made a fresh batch of tea to the approval of the vendor, teams must roam the busy morning streets of the souk and sell five dinar worth of tea to receive their next clue. In Shisha Time, teams must correctly assemble four shisha and then safely transport them across the souk to a provided address to receive their next clue. 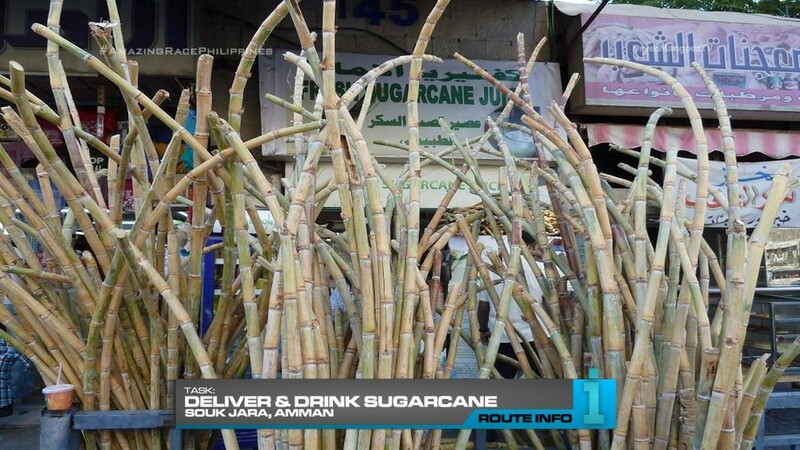 After completing the Detour, teams will be given two big bundles of sugarcane which they must carry with them through the souk to marked sugarcane juice stalls. Here, teams will grind one bundle of sugarcane and drink its juice to receive the next clue. That clue reveals the Road Block: Who doesn’t mind working with spits? 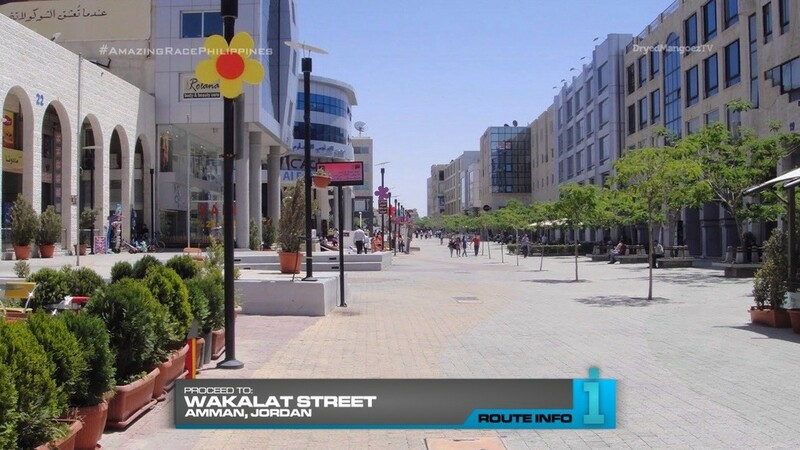 For this Road Block, teams will make their way to the rehabilitated commercial district known as Wakalat Street where they will must correctly set up a shawarma spit, cook meat and then shave off enough meat from already cooked meat to fill a marked bowl in order to receive their next clue. Teams can now make their way to the staircase at King Faisal Street. Teams must search amongst the umbrellas hanging overheard for one that matches the umbrella they obtained earlier in the Leg. Once they have found the matching umbrella, they must figure out a way to exchange the hanging umbrella with the one in their possession. The hanging umbrella will contain the location of the next Pit Stop: The Roman Theater, to which teams must make their way on foot. AND they must enter from the top of the theater. This should be a pretty solid Leg. It is very simple, but for an early Leg with 11! teams, it should feel very full. 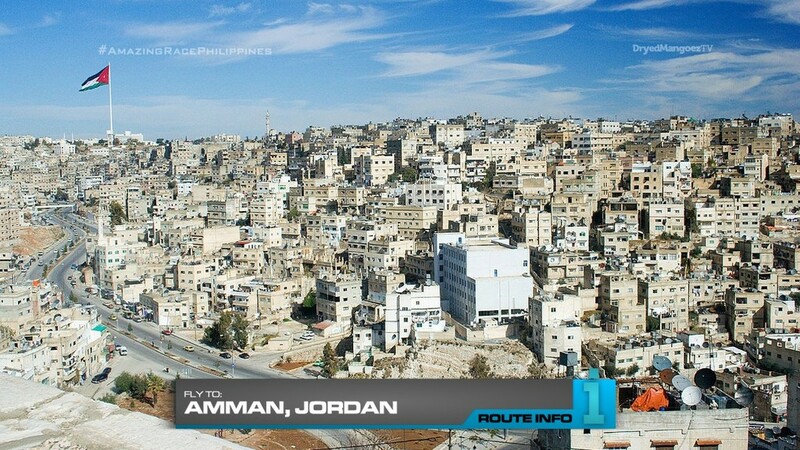 Jordan is a country that definitely should be visited on TAR. Any TAR. It’s a nice, relatively safe and fresh Middle Eastern/West Asian country. Kuala Lumpur was the easiest connection to Amman. And I was definitely set on having Jordan on this route. The logical flights from Kuala Lumpur all arrived in the early morning. So an Hours of Operation is definitely needed. I’ve learned to appreciate equalizers in the era of simplified Legs and poor tasks on American TAR. But I reference TAR China 3 again by pointing to how their Legs have teams start out basically only minutes apart, regardless of their actual Pt Stop arrivals on the last Leg. Doing that has only affected the Race for the better. Teams are competitive, it’s not unfair to anyone and it makes for an overall more exciting and actual Race. TARPHDME has had a routine of doing “Keep until further notice” tasks. It’s a nice task to have once in a while to keep teams on their toes. Plus, it’s always a great heartbreaking TV moment when teams don’t pay attention and either lose the original clue/item or don’t think to check it, in other cases. Hehe. The sugarcane task came about when I saw there was a bunch of sugarcane juice stalls in the souk. This could easily be a Detour choice. But I needed more extra Route Markers on this Leg. The shawarma Road Block is a must. Something with shawarma would be a good task at any point in this Leg. 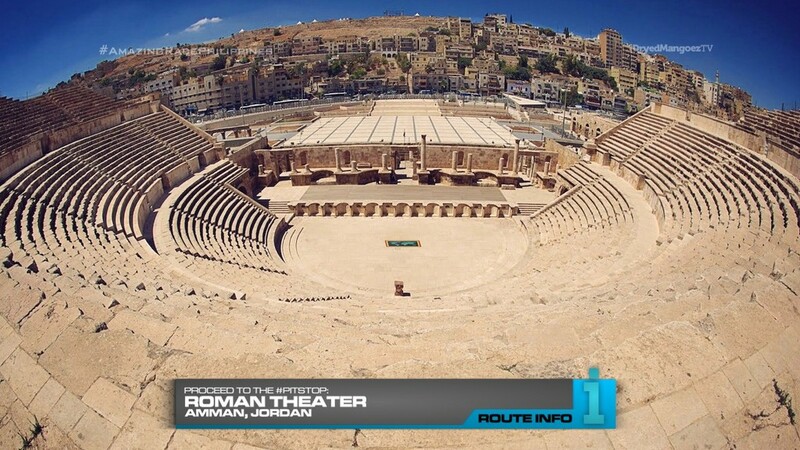 The Roman Theater would look AMAZING from 4K UHD drone footage. And making teams go on foot (it appears close to the King Faisal Street staircase) AND from the top of the theater should add another extra little challenge at the end of the Leg. Overall, a nice though simple Leg in Jordan’s capital city!